Apple updated its mobile app for its Worldwide Developers Conference, which will be held June 8 through June 12 at San Francisco’s Moscone Convention Center. 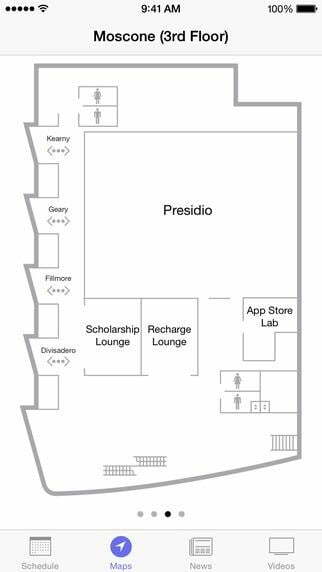 The app provides attendees with information on upcoming sessions, news, venue maps, and videos. This year, the WWDC App also works on the Apple Watch, making it easier to access conference information right from your wrist. Developers attending WWDC will be able to add their pass to Passbook for a much faster check-in, too. Those with watches will be able to simply flash their wrists to enter the building. 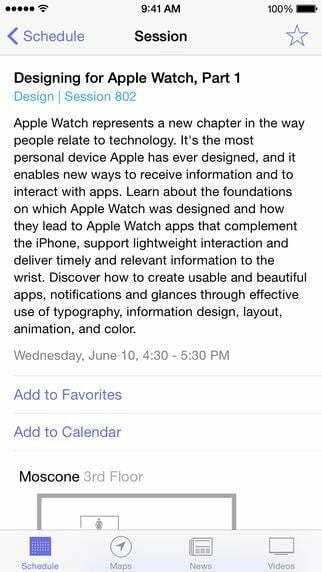 If you’re unable to make the event, you can watch streaming video sessions from the WWDC app. As of right now, the app only features videos from previous years, but will change when WWDC 2015 starts. At that point, users will have access to content from the many events at the conference. 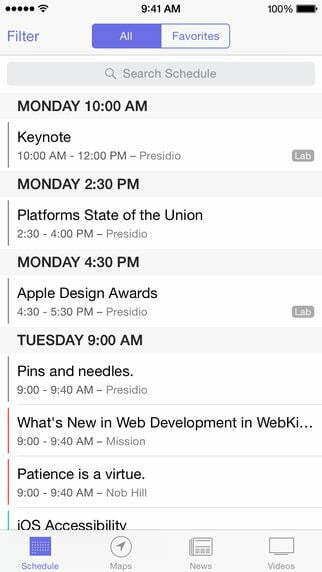 The WWDC 2015 app version 3.0 will also give users the ability to add sessions to their calendar, listen to session audio after they’ve left the app or locked on their device, and give feedback on session videos from the Videos tab. Apple’s WWDC will feature over 100 technical sessions this year, presented by Apple engineers, and tons of hands-on labs, so there will be a lot of content to check out in the app. Last year, Apple unveiled iOS 8 and Yosemite. This year, the focus will be on iOS 9 and OS X 11. It’s been said that OS X 11 and iOS 9 will look alike and will offer a wide range of tasks. It’s been rumored that Apple will reveal a revamped Beats Music streaming service and a new streaming TV service. There’s also a chance Apple could unveil additional development kits, and who knows if we’ll get a chance to see the new hardware. This year’s keynote will take place on Monday, June 8 from 10 a.m. to 12 p.m. PST. Apple will stream portions of WWDC 2015 on its website and on the app. You can download the WWDC 2015 app from the App Store here. Mmm... Which dessert should Google pick for Android M? Vote now!